Have you ever felt that your WordPress dashboard has additional clutter that you do not want. Sometimes added by additional themes, plugins, or maybe you don’t like one of the default widgets. In this article, we will show you how to customize WordPress admin area (Dashboard) without writing any code. For this tutorial we will be using the “Screen Options” feature in WordPress. The downside of this is that it saves the settings on per-user basis. If you have a multi-author blog, then you might want to read our next post in the series this week. If you open your WordPress admin area, look at the top right: there is a tab labeled Screen Options. Clicking on it will bring down a menu with check-boxes and radio buttons. As you can see that there are quite a few options there. You can check off each option that you do not want in your dashboard. 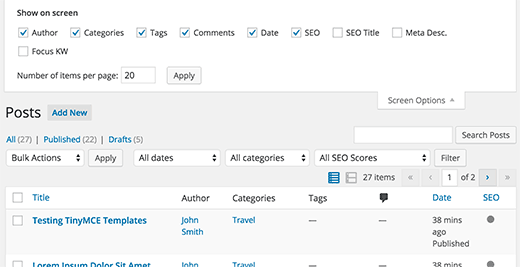 For some pages in the WordPress admin area, you can even add more columns if you want. Some times WordPress plugins may also add options here. For example, WordPress SEO plugin will add SEO options which you can show and hide on the posts page. If you do not like the way your write panel is organized, you can drag and drop boxes there as well. But furthermore, you can add and remove things just like the dashboard. Simply click on Screen Options Tab and start unchecking the box that you do not use. The biggest question that is often asked is how to increase the number of comments shown on the backend. Because by default it only shows 20, but some users may like to see 50 comments when moderating because it makes the job easier. Well that can be achieved with Screen Options as well. Simply go to the Comments page and click Screen Options. 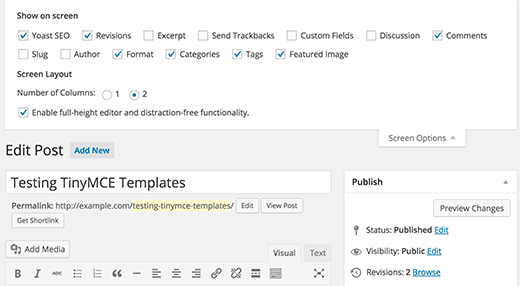 You have the Screen Options tab on just about every page of the WordPress admin panel. If you are a total beginner, and do not want to edit codes. Well this is your best method of customizing your WordPress Dashboard. I did use the wordpress during the college about 3 years ago. Right now, I don’t want to use hosting service…just want to use the wordpress to practice more, updated stuff to learn and play around. Is there a way to use without install the hosting? No. However, you wouldn’t have to deal with hosting stuff. Once setup properly, your WordPress site would run without you having to manage any hosting related issues. I think this is most basic yet most important part. Everyone don’t know how to customize admin area in WP and your article is very helpful for the. You know I have been using WP for about 2 years and have never looked at changing the Admin area to be more suited to my needs, I didnt even know it could be done! thanks for the tip, will get on it!